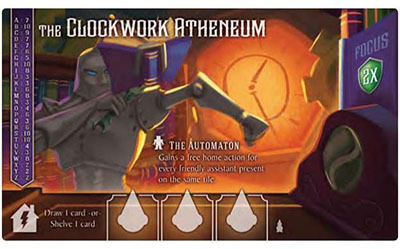 When the Automaton visits a location or your library, prior to activating any effects ,you may perform one home action for each of your other assistants already present at the location. 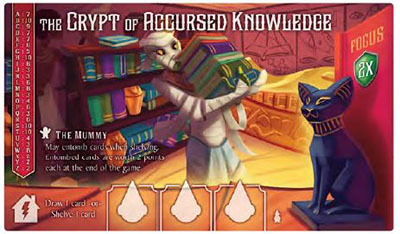 When the Mummy shelves a card, you may entomb the card by placing it either directly on top of, or directly underneath, a previously shelved card in your bookshelf. 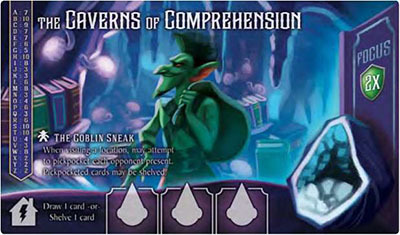 The bottom card of the stack is flipped face down and its icons no longer count during scoring. You may never have more than one card under each card in your bookshelf. 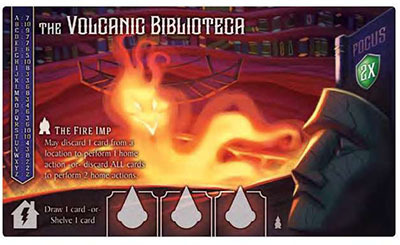 At the end of the game, entombed cards in your bookshelf are worth 2 points each. Add the total to your shelf stability bonus. Note: If the top card of an entombed stack is discarded for any reason, the card remaining underneath is no longer considered entombed, but stays flipped face down. The Sasquatch may only visit locations where opposing assistants are not present. 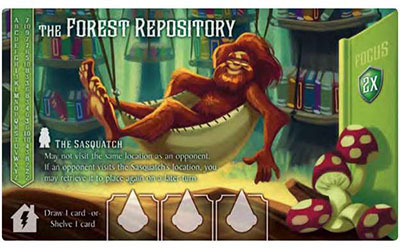 If an opposing assistant visits the same location as the Sasquatch, before they activate any effects or abilities , you may choose to retrieve the Sasquatch - it may be placed again on a subsequent turn this round. 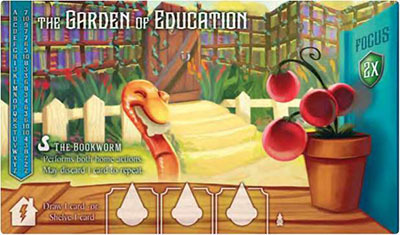 When the Bookworm visits a home action space, you may perform both home actions. Afterward, you may discard a card from your hand or bookshelf to repeat the process once. 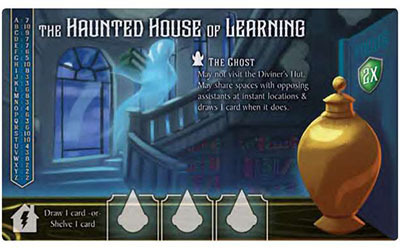 The Ghost may not visit the Diviner's Hut . (The Diviner has warded her hut from uninvited spirits). You may place the Ghost on assistant spaces that are occupied by opposing assistants at locations with instant effects; the two assistants share the space. 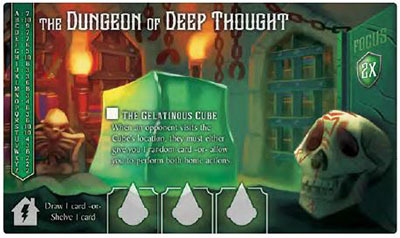 When you do so, prior to activating any effects or abilities , draw one card from the deck. Afterward, activate the location's effect. You may not use this ability on locations with delayed effects. As long as the Snowman is on an assistant space at a location with an instant effect, no more assistants may visit the location. 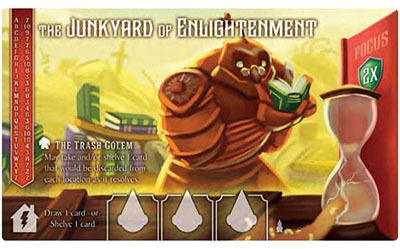 If the Trash Golem is present at a location during step 2 of the Resolution Phase, you may choose one card that would be discarded from each location as it resolves and either take it or shelve it. Continue this process until the Trash Golem's location itself is resolved and its token returns to you. 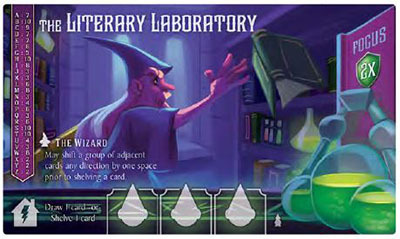 When the Wizard shelves a card, you may shift a group of any number of adjacent cards in your bookshelf one space in any direction to create one or more empty spaces, then shelve the new card in a newly created empty space. 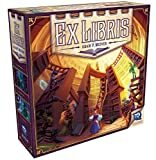 Your bookshelf may disconnect temporarily, so long as it follows all shelving rules after the new card is added. 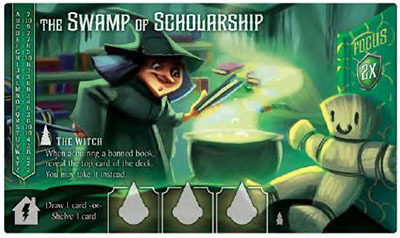 Any time the Witch acquires a card containing at least one Banned Book, reveal the top card of the deck. 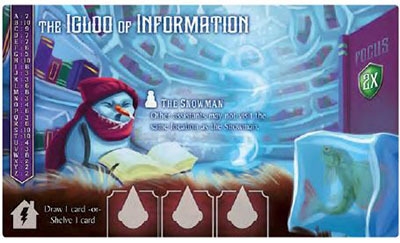 You may take either the original card or the revealed card, then discard whichever card you did not take. Note: If a location tile has only one card in its card area, you may only choose option A above.